I think Mark Twain was onto something when he penned the above sentiment. Edinburgh and New Orleans opened up my eyes to so many new experiences. I can further say that one has not experienced Basel until they attend some of the Fasnacht activities. Fasnacht took place during the three days of 11 through 13 March and it transformed this quiet city into a colourful, joyful and spirited party for three full days. We went in fully unprepared for what we were about to witness. On Monday we went to the parade starting at lunchtime. I had my alarm set for three to go see the start at four, but the need for sleep won. The parade showcased the different groups and their bands and the various lanterns were carried around. What I loved seeing was all of the mimosa blossoms on the wagons. They were so fragrant and occasionally they would be given out to the spectators. Candy was thrown to the kids as well as fruits and vegetables which can hurt by the way if you happen to not catch it. Some kids went with big bags and scooped up all the candy they could which reminded me of Halloween in the US. The second day we went to the children’s parade which was adorable. Later that day we walked to the area of town where all of the lanterns were being displayed. Dusk came and the lanterns came to life as they were lit up. I could make out some of the messages in the artwork, however some of the more locally politically directed lanterns left me wondering what exactly they meant. Some seemed racially directed, several were obvious about the new phase of global geopolitics we find ourselves in and others were celebrations of milestone events. It was a great first experience. Now that we know the many rules of attending Fasnacht, I am sure that next year will be even better. In other news, we finally got the keys to the house and the movers have already unpacked all of the boxes. Here are a couple of pictures of the empty house and a surprise guest – the friendly neighborhood cat. Can you believe that it actually came into the house and wanted to wander around? My son was thrilled. As you read this we will finally be living in the house and trying to set up the rooms and a routine. Perfume will come back next time. Who likes chocolate? Most people I meet enjoy chocolate from time to time. Of course there are exceptions and truth be told, I am always a little bit surprised when someone tells me they do not like chocolate at all. There are those who like milk chocolate, dark chocolate, chocolate candy bars or even pralines. As a child I loved milk chocolate and as I have gotten older, my taste buds have developed a love for dark chocolate. Anything over 70% will peak my interest. Hey there APJ! How are you all doing? Getting ready to celebrate Fat Tuesday – Mardi Gras? Well, here in Basel it is called Fasnacht and it is actually held the week after Mardi Gras. Apparently it is a huge deal here and the festivities begin at 4 am on 11 March on a bridge. Whether or not I can drag myself out of bed at 3, let alone my nine year old, remains to be seen. This is a festival dating back to 1529 and common theory states that after the 1520 Reformation, they wanted to differ from the Catholics and therefore celebrated a week later. This has deep roots here and it will be fascinating to see. 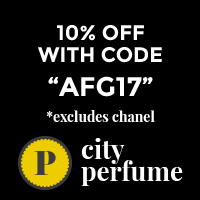 Hey there fellow perfume lovers! How are you all doing? Please forgive me. I had grand plans of reviewing something for you this week, but I had an unfortunate encounter with some serious gluten upon my arrival and I cannot stand any perfume or strong smells. My poor tummy is in agony here. Happy New Year APJ! I cannot quite believe that we are now in the year 2019. It was only yesterday that we rang in the year 2000. How time flies! Especially as I get older it seems to pass by me at lightening speed. We had a quiet Christmas and New Year this year, which is just what the doctor ordered. Family time is cherished and we managed to spend a lot of quality time together learning new games and playing cards together. As the holidays are now over, I can sit back and reflect on what passed and what is to come.